Representatives from Summit County have joined together with local governments and agencies from throughout the Colorado headwaters communities to try to protect future water resources. Governor John Hickenlooper sent an executive order in May calling for river basin roundtable groups throughout the state to come up with plans to resolve gaps in the water supply by December 2014. Each of these documents will come together to form the Colorado Water Plan. Stiegelmeier sits on the Colorado Basin Roundtable, which represents Summit County water interests, among others. Nine roundtable groups were formed throughout the state in the 1970s to address gaps in the water supply. While many studies have been completed since then, there has been little forward movement has as far as putting a plan into action, Stiegelmeier said. The governor’s executive order is meant to spur the Colorado roundtables into action, she said. “We are taking information from studies and focusing on where we think we can solve our own gaps,” Stiegelmeier said. The county commissioner said her group is also working to make sure other roundtable group’s plans don’t infringe on the Colorado Basin Roundtable plan. In addition to the Colorado Basin Roundtable, the county commissioner sits on the Northwest Colorado Council of Governments (NWCCOG) Water Quality and Quantity Committee. This group strives to bring individual governments and agencies together to speak with a unified voice on water issues. 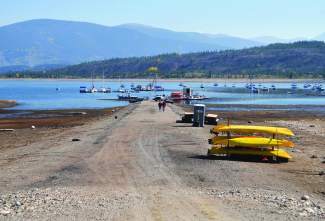 It includes members from Summit, Grand, Gunnison, Pitkin and parts of Park County, as well as cities and water sanitation groups within these counties. “It started as an effort to get county and municipal governments on the same page to be a stronger advocate to keep water on the West Slope, and mitigate the damage from trans-mountain diversions,” said Torie Jarvis, co-director at the NWCCOG Water Quality and Quantity Committee. This group has been focused on the implementation of the Colorado Water Plan, and has developed a number of principles to represent the interests of stakeholders on the West Slope. “There is an unknown floating out there where multiple basins are eyeing water from the same basin,” Jarvis said. “If we want our interests represented we need everyone to understand what’s on the table, and need as many people as possible to bring the values of the Western Slope to the forefront of state planning,” she said.